This retreat will have 3 elements 1) Chant, you will leave with your own personal chant you create, 2) Kriya for all 7 Chakras, 3) Meditation, always ending each session singing "Longtime Sunshine". In order to cover all the elements we will need a full attendance from Friday evening till Sunday. You are welcome to video the kriyas for each Chakra to assist your personal practice once you return home. All meals are included. Each room has a different price. The home is very open and huge, 4,300 square feet. It is not a dorm or retreats bedroom setting. Aat the ranch offers a 40 foot by 40 foot inside space for our discussions and practices. The sleeping arrangements are unique. This is a home and it has four bedrooms and five beds. Each room is unique, from the Wyoming room, the guest room, up to the 24 foot by 20-foot celestial star room, 10 glass windows, and a six foot by six-foot glass ceiling above the queen bed. Both the Wyoming room and Celestial star room have only a queen bed. You could also have four twin mats on the floor in the star room. This is where the opportunity to examine sleeping arrangements in a new and different light. Then at the other end of the home, 50 feet away, the home has two more unique bedrooms Superhero room with a lovely king bed and you could also have two twin mats on the floor space. The tree room has a queen bed and on the other side of the 3/4 wall, you have an antique four-poster full bed. Yoga sessions will take place outside on the cemented area. If the weather does not cooperate, yoga will be hosted in the large living room. On your first full day together, you will have the opportunity to go on a short local hike, participate in kundalini workshop, an intro to meditation workshop, relax by the pond, take a nap, or make new friends. The day is to disconnect and reconnect with yourself, nature and other like-minded individuals. This retreat will have 3 elements 1) Chant, you will leave with your own personal chant you create 2) Kriya for all 7 Chakras 3) Meditation Always ending each session singing "Longtime Sunshine" In order to cover all the elements we will need a full attendance from Thursday evening till Sunday. You are welcome to video the kriyas for each Chakra to assist your personal practice once you return home. 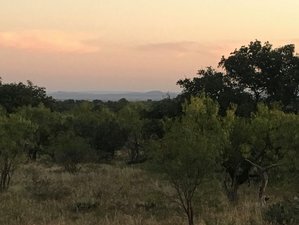 We will drive once off the ranch up to the Llano river located 5 miles north of the ranch. This weekend advancement takes place in the Hill Country of Central Texas, USA. Please book your flight to arrive either at San Antonio International Airport (SAT) or at Austin Bergstrom International Airport (AUS). Aat The Ranch will provide transportation from Austin Airport for 75 USD each way. If required, exact directions will be emailed to all registered participants. Airport: San Antonio International Airport Airport transfer available: San Antonio International Airport (US$100 per person) Additional charges may apply. You can request this in the next step. Airport: Austin–Bergstrom International Airport Airport transfer available: Austin–Bergstrom International Airport (US$75 per person) Additional charges may apply. You can request this in the next step.